Another vertical group will be responsible for characterization (e.g., synchrotron, optical, magnetic, and charge transport). 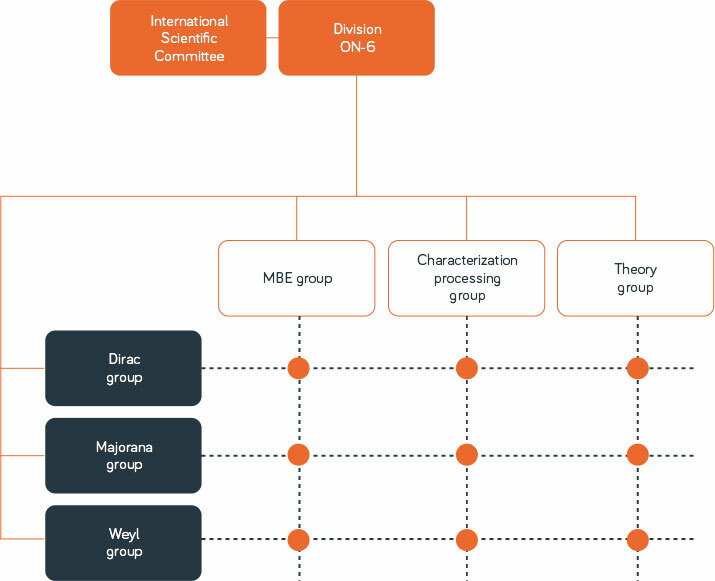 Horizontal group, with strong involvement of vertical groups, will search for new phenomena, materials systems, and devices; in the diagram above these teams are named Dirac and Weyl, though actual research directions will be set by their leaders. Each group will (typically) consist of a leader, one postdoc and 2-3 PhD students, all financed by MagTop that also provides substantial operation funds. Additional groups, researches, equipment, and a support for running costs can be funded by national or international research projects acquired by group leaders and postdocs. New group leaders will be recruited via open international calls conducted by the International Scientific Committee. Internationally competitive salaries in line with expertise and research potential will be offered. The group leaders will appoint postdocs and PhD students via open international calls supervised by MagTop Management (see, Researchers Employment and Open Positions).